The Royal Arsenal Gardens is the most recent to be opened and occupies former industrial land. The Green Chain, a linked series of linear and circular walks, include some of those open spaces within Greenwich. The Chain originates at three points along the River Thames and stretches to Crystal Palace Park. 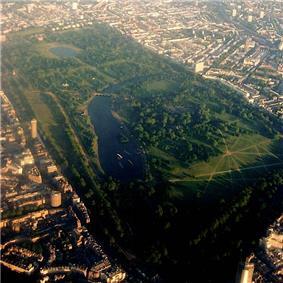 Avery Hill Park is one of 11 parks throughout Greater London chosen to receive money for redevelopment by a public vote. The park received £400,000 towards better footpaths, more lighting, refurbished public toilets and new play areas for children. Greenwich is a riverside borough, and one of the largest open spaces is the Thames itself, forming the northern boundary of the borough. A sign posted riverside trail forms a walkway for both pedestrians and cyclists. Local Nature Reserves in the borough are: Gilbert's Pit, Maryon Park, Maryon Wilson Park, Oxleas Wood and Sutcliffe Park.